A genus of 25 species with hundreds of varieties. It is a flowering, perennial plant that grows across North America, Europe, Africa, Asia, and Australia. They are known to be aromatic, a fresh, clean, and refreshing scent. It is best grown in wet environments and can grown to be 120 cm tall. Green Leaves coarse surface, thin stem. Choosing: Look for fresh leaves and green leaves. If mint is not fresh, the leaves will look dull and wrinkled. Used in teas, beverages, jellies, syrups, candies, and ice creams. Good with lamb. Add to loose tea leaves. It is also used in rice, curry. 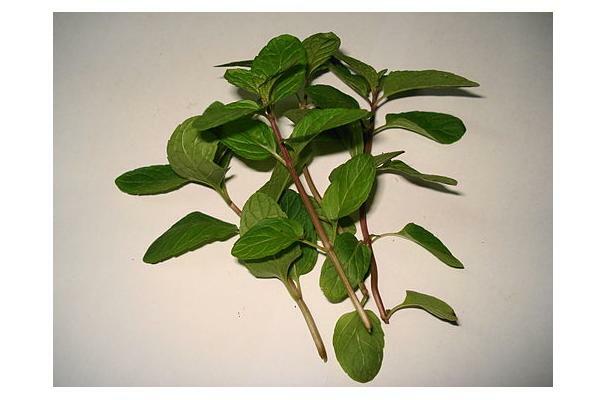 Cleaning: Wash mint leaves thoroughly in cold water to remove impurities and pesticides. You could jus rub leaves one against another. Mint leaves can be refrigerated for some time. Wash the leaves and wipe it with a dry paper towel and wrap the leaves in clean dry paper towel and place it in a container in the refrigerator. Stays fresh longer this way. History: Mint descends from the Latin word mentha, which is rooted in the Greek word minthe, mentioned in Greek mythology as Minthe, a nymph who was transformed into a mint plant. The word itself probably derives from a now extinct pre-Greek language.